I would love to tell you that as a Mum and someone who posts A LOT of recipes on her blog, I always cook from scratch. That would be a total lie. It takes a long time to cook from scratch, and when you have three hungry kids, have just been to 2 different after school clubs, you want/need to make life easy. Why do all the hard work when someone else can do it for you? Sometimes us Mums need to help ourselves a bit. That is where Dolmio come in. They have challenged bloggers to come up with some simple week night recipes using their Bolognese sauce. I have to admit that I am sure I read somewhere that there was loads of sugar in a jar of Dolmio, but there is just 2 teaspoons of sugar beet in there. The best thing about Dolmio Bolognese sauce for me is it's versatility. It can be used for Bolognese as the name suggests, but it can also be used in lasagne, meatballs and a whole array of other dishes. Dolmio kindly sent me a hamper of food and for one meal (at little man's request) we had slow cooked meatballs using the Domio as the sauce and adding some mushrooms and courgettes too. I kid you not, middle man asked for thirds! I decided that I would use the other jar to make a Parmesan chicken dish. When the boys were younger I used to chop the vegetables really small so that they couldn't see them and complain. Thankfully now they are older they are usually less fussy and more willing to try new things. Plates were clean so everyone including me was happy! Using a food processor use a slice of bread to make breadcrumbs. Use this time to fry the courgette, garlic, aubergine and onion so that it is soft. When the chicken is nearly cooked through add the vegetables on top of the chicken and then the jar of Dolmio Bolognese sauce.Top with some more cheese if desired and put back in the oven for around 5 minutes. This dish is lovely served with jacket potato, chips, rice or pasta. For me being a Mum is about serving my boys food that they will eat which is also good for them. 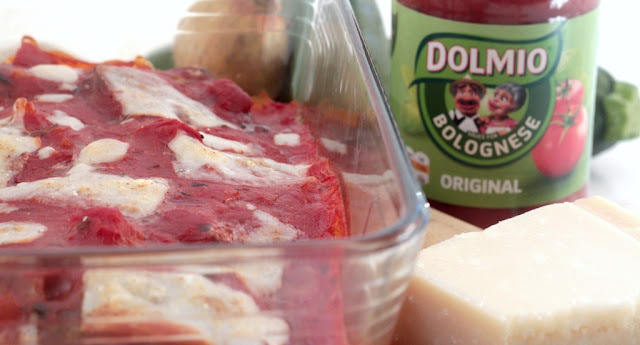 #Thankgoodness for Dolmio for helping me save some time in the kitchen on weeknights.